In this blog post, you will read about how to translate Excel online with free Excel translator websites. For that, I’m covering two ways to translate documents online. Both the websites let you browse the excel file from your computer. Once you upload the excel file, you can select the language in which you want to translate the document. 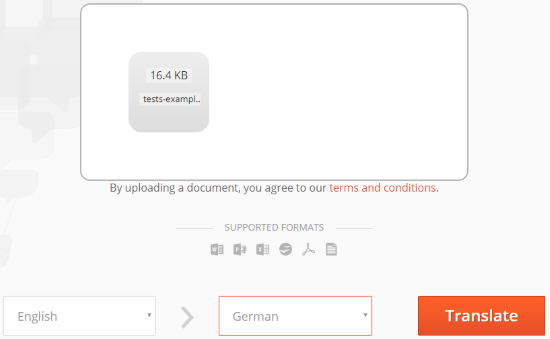 When the file gets translated, you can download it on your computer. Apart from uploading the Excel file, you can upload other file formats as well. The supported formats are DOC, DOCX, PDF, XLS, XLSX, PS, RTF, TXT, PPT, PPTX, and ODF. You can translate these documents into hundreds of languages. Both the sites support more than a hundred languages. It includes English, German, French, Latin, Hindi, Russian, etc. The sites take care of the layout and the maintenance of the excel file. It is very easy to use these websites and on top of that, you get a good output. You can also convert text online. But here we’ll talk about excel translation. Let’s quickly go through the websites and translate excel online. OnlineDocTranslator is one of the good websites. As the website name implies, it is an online document translator. The site supports formats such as PPT, PPTX, DOC, DOCX, PDF, XLS, XLSX, TXT, SRT, ODT, ODP, and ODS. When you visit the website, you will see Translate Now in the middle. In order to translate the document, you can click on that. After clicking on the Translate button, you can translate the excel file from one language to another. To do so, you have to drag and drop the excel file in the interface. Also, you can browse the file from your computer. Once the file gets uploaded, you can select the language in which you want to translate Excel file. The site supports more than 100 languages. You can take the help of dropdown to view all the languages. The language list includes English, German, French, Latin, Hindi, Russian, Punjabi, etc. When you select the language of the document and the preferred language, you can click on Translate. The file quickly gets translated and provide you a link. Clicking on that link will download the file on your computer. In this way, you can easily translate excel online. Google Translate can be another good option to translate Excel online. It translates documents as well as text. You can easily translate a document file from one language to another. Using Google Translate, you can convert in 104 languages. The excel file can be translated into English, Russian, Hindi, French, Swedish, Turkish, Hebrew, Irish, and so on. To translate a document file, you can upload with DOC, DOCX, PDF, XLS, XLSX, PS, RTF, TXT, PPT, PPTX, and ODF types of file formats. When you open the link, you will see the interface where you can drop the excel file. Once you click on the Browse your computer button, you can add the excel file in the interface. Then, you can the language from the list to translate. After selecting the language, you can click on the Translate button located on the right. After that, you will notice the entire file translated in the chosen language displays on the window. You can save the file on your computer as well. There are very few options available online for translating the document. But most of them are not free or do not provide good output. The above-mentioned websites are the best way I found to translate excel file. You can convert a file of one language into various languages. You can try these options and translate excel online.